Economically speaking, the gap between states with renewable energy sector policy support and states without it is incredibly vast. States with no incentives or legislative support for renewable technologies see almost no investment in renewable technologies when compared with supported or incentivized states such as California, Massachusetts, and New York. While many other states lead in per capita investment, California’s sizeable population and economic footprint make it the largest driver of renewable energy in the nation, especially in solar power. It’s even the nation’s largest investor in electric vehicles. As the leader in renewable energy sector policy, the state is eyeing a totally clean energy grid in the coming decades. Vermont is a national leader for grassroots cooperative energy production and is the only state to rank in all ten of the Union of Concerned Scientists’ indicators for renewable energy development. Vermont is also the number-one state in the nation for per capita renewable energy employment, with over 18,000 individuals driving economic growth and a greener energy portfolio. Massachusetts makes a high appearance in nine different categories of renewable energy market drivers listed by the Union of Concerned Scientists, and the state is first in the nation for policies that incentivize utilities to grow their local renewable energy markets. Solar energy production per capita is in the national top five, and new investments in wind energy promise continued growth. In 2017, Massachusetts utilities signed their first offshore wind agreements, opening up a new investment market for homeowners drawn to innovation and bleeding-edge markets. Rhode Island’s concentration on policies and initiatives that incentivize greenhouse gas reduction have made it a top state for emissions mitigation. It was the first state in the U.S. to invest in offshore wind farms, a rapidly expanding new market for wind power. Additionally, the state’s investments in residential solar are among the highest in the nation, and Rhode Island is investing in hydro and biomass to round out an impressive portfolio of technologies. Hawaii is first in the nation for residential solar per capita and is investing heavily in geothermal energy. Big challenges still remain for Hawaii, though; 91% of the energy the state consumed in 2015 was imported, with petroleum as the primary source. Hawaii’s energy-conscious residents consume the fourth least amount of electricity in the nation and are keen investors in solar energy, driving a major employment market for the state. Oregon’s decision-makers are keeping pace with the state’s rapidly expanding renewable energy sector by offering legislative support and incentives. New investments helped wind power grow to 11% of the state’s total energy consumption in 2015. Clean power initiatives include community investments in wind and solar, and these cooperatives allow homeowners to invest in the growing market without installing anything on their own properties. Maine more than doubled its commitments to wind power between 2011 and 2015, accounting for three-fifths of the total wind production for New England and 14% of the state’s electricity consumption. The state is also a leading producer of biomass energy, accounting for 25% of the state’s energy production—on par with its commitment to hydropower. Washington has been a longstanding national leader in hydroelectric power generation, the largest source of electricity in the state. In recent years, Washington has diversified its portfolio, expanding wind power generation to cover roughly 6% of the state’s total electricity production. Washington’s residents are also number three in the nation for electric vehicle adoption, trailing behind Oregon and California. New York is a policy leader for the renewable energy market, and New York’s State Energy Research and Development Authority (NYSERDA) has been a major driver of renewable technologies since 1975. The state continues to lead with innovative legislation—like the NY Green Bank, a proven green investment strategy that promises to build a foundation for future growth. Local incentive programs such as the NY-Sun Initiative have helped the state grow its residential solar market by over 800% since 2011. Between 2008 and 2015, Iowa’s total energy production from wind grew from 4% of its total consumption to a whopping 31.3%, making the state the national leader for wind power. 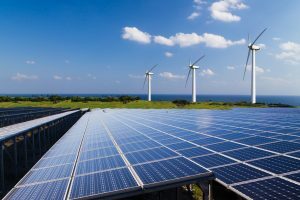 Local governance boards, such as the Iowa Utilities Board, are approving massive-scale solar projects, like the privately funded Wind XI installation, which point to even more renewable energy development in Iowa’s future. This state is an industry leader in the Midwest, where renewable energy adoption has increased rapidly. How does your local town or city perform in renewable investments and incentives? Share in the comments below.